Born August 24, 1926, in Bradford, he was a son of the late Clarence T. and Gladys (Deloe) Johnson. On April 9, 1948, in the First United Methodist Church he married his sweetheart Frances B. Bennett Johnson who preceded him in death on January 21, 1999. Ted was a 1944 graduate of Bradford High School. On November 25, 1944 he was drafted into the United States Army. He served in Europe during WWII, and was honorably discharged on November 10, 1946. In 1946 he began working at Case Cutlery. 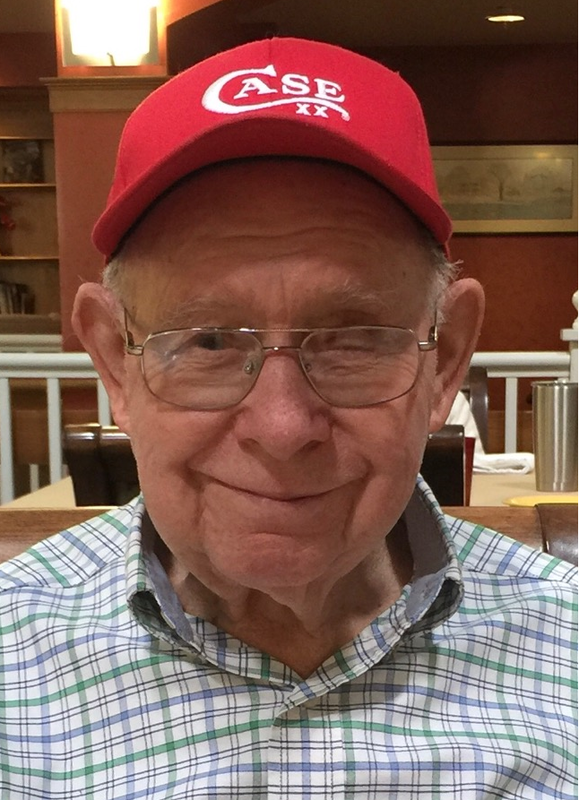 On September 30, 1950 he was ordered back to active duty with the United States Army and served in Korea until his second discharge from duty on November 23, 1951. He returned to Case Cutlery and retired after 41 years of employment. Ted was known for his ease in frequent conversation, with even total strangers. Throughout his entire life, he possessed a contagious smile and an entertaining sense of humor. He maintained a sweet and humble demeanor that won the hearts of those which he came in contact. His signature gift of joy, happiness, and a positive disposition shown through constant smiling, laughing, and joking around, will never be forgotten. Ted was a very active member of the Asbury United Methodist Church most of his life, having served on various committies and boards. He was a member of the Greater Bradford Senior Activity Center and loved to sing with “Linda’s Group”. He was also a member of the American Legion Post 108, the Veterans of Foreign Wars Post 212, and the Bradford Moose Lodge. Surviving are two daughters, Jeanne M. DuBois, of Bradford, and Carol L. (Dave King) Hicks, of Leland NC,, one son John (Connie) Johnson of Derrick City, five grandchildren, Staci, Jamie, Nicole, Amy and Danielle, eight great grandchildren, Oliver, Alsatia, Chloe, Lindsey, Grace, Everlee, Nash and Riley, one great great granddaughter Ryleigh. Ted was preceded in death by his parents, wife, two brothers in infancy, one sister Phyllis Johnson, and two son-in-laws Michael DuBois and Butch Hicks. There will be no public services observed. Private services for family will be held in the Hollenbeck-Cahill Funeral Homes Inc. with the Rev. Matt Blake, Pastor of the Bradford Area Parish, officiating. Burial will be in Willow Dale Cemetery. Memorial contributions if desired may be made to the Asbury United Methodist Church or the Bradford Senior Activity Center. I have fond memories of both Ted and Fran and my times with them....they were of great comfort to me in my time of need. They deserved each other and raised a great family. Thoughts and Prayers at this difficult time. Ted will be truly missed. I will miss his warm smile and his cheery greetings. I will miss the way he would ask me for a cookie, or if he could hold my hand or give me a hug. Always a sweet, kind "GENTLE MAN". It was an honor to know him and he gave me joy! He loved to dance... he will be dancing each day. Take comfort knowing there is another Angel in heaven and he is one who truly loved his family and will be watching over all of you. RIP Ted, You were a truye gentleman. still remember when Gene and I came to your house for coffee and Fran had you get the plates out, which you forgot to wash and put away dirty. I can still remember the great laugh we had over it. OUR THOUGHTS AND PRAYERS ARE WITH YOU. HEAVEN HAS GAINED ANOTHER ANGEL.